2 Ounce Dried Coffee Cherry Tea - Bolivia Certified Organic Co. This is loose leaf, single origin,Caturra varietal coffee cascara, called Perla Negra. It is grown organically and processed inCosta Rica by the Las Lajas micromill. Cascara is the husk and fruit ofthe coffee cherry which is removed before the beans are processed for coffee,and dried. The dried cascara is steeped, just like tea, to make a veryrefreshing, mildly fruit flavored, mildly tea flavored, mildly acidic andnaturally sweet beverage. The flavor is reminiscent of apple juice with cherry,cranberry, raisin, and honey flavors. The caffeine content varies, depending onhow you prepare it, but is generally around 1/3 of the caffeine of regularcoffee. Cascara is also loaded with antioxidants. Preparation: We like 2-4Tbsp per mug, steeped with 205F water for at least 6 minutes (cascara will not overextract the way coffee does), and strained with a wire mesh filter. Forstronger flavor, pour boiling water until the cascara is just covered by about1/2" and steep for 8-10 minutes. For additional sweetness, honey worksvery nicely. We enjoy it both hot and cold. When chilled and served over ice,it tastes like a fruited iced tea with lightly citrusy finish. If you let itsteep until cool, it will emphasize the natural sweetness. Used cascara can bere-steeped with reasonable results if you add around 20% fresh cascara. It canalso be cold brewed for 12-14 hours. 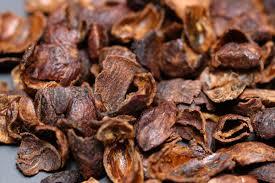 Cascara may also be eaten straight or used for baking (like driedcranberries).